In this volume ten expert historians and legal scholars examine the Civil Rights Act of 1866, the first federal civil rights statute in American history. The act declared that all persons born in the United States were citizens without regard to race, color, or previous condition of slavery. Designed to give the Thirteenth Amendment practical effect as former slave states enacted laws limiting the rights of African Americans, this measure for the first time defined U.S. citizenship and the rights associated with it. Essays examine the history and legal ramifications of the act and highlight competing impulses within it, including the often-neglected Section 9, which allows the president to use the nation’s military in its enforcement; an investigation of how the Thirteenth Amendment operated to overturn the Dred Scott case; and New England’s role in the passage of the act. The act is analyzed as it operated in several states such as Kentucky, Missouri, and South Carolina during Reconstruction. There is also a consideration of the act and its interpretation by the Supreme Court in its first decades. Other essays include a discussion of the act in terms of contract rights and in the context of the post–World War II Civil Rights Era as well as an analysis of the act’s backward-looking and forward-looking nature. 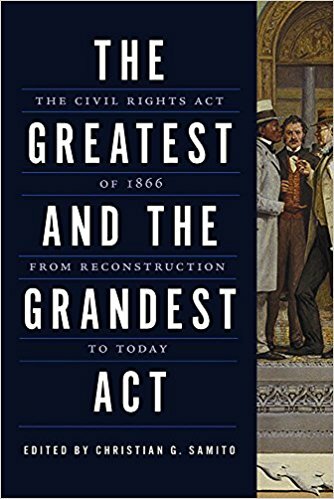 Reviews and Praise for "The Greatest and Grandest The Act"
Christian G. Samito has brought together an impressive array of historians and legal scholars of the first federal civil rights law in American history. With lucid analysis and keen insight, The Greatest and the Grandest Act deftly guides the reader from the ambiguities of the Act’s inception all the way to its continued significance today.